Trade war escalating concerns backed yen's gains. US employment data to set the tone heading into the weekend. The USD/JPY pair fell to 112.22, touching its 100 DMA for the first time since October 26 before bouncing some. Yen's demand was a result of the ruling risk aversion, with worldwide indexes closing sharply lower, and particularly referring to US ones, sinking into negative ground for the year. The arrest of a Chinese tech giant Huawei executive at the request of the US government has spurred concerns that the trade truce will come to an abrupt end, particularly after Trump called himself a "tariff man." The pair bounced alongside Wall Street, as the US House approved a spending bill to fund the government for the next two weeks. Also, pouring some cold water were comments from Fed's Bostic, who said that the central bank is at shouting distance of neutral rates. Japan will release early Friday the preliminary Leading Economic and the Coincident indexes for October, while later in the day, the US will release November employment figures. 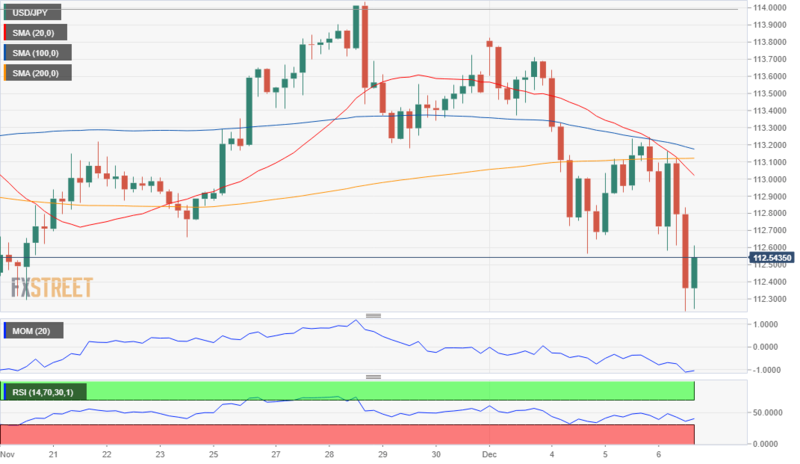 From a technical point of view, the risk remains skewed to the downside, as, in the 4 hours chart, the pair is developing well below its 100 and 200 SMA and with the shortest about to cross the longer one to the downside, while technical indicators head south, the Momentum retreating from its mid-line and the RSI nearing oversold levels. The 100 DMA is a key psychological support and if it gets broken, the decline will likely gain traction, with the next possible bearish target coming at 111.60.